BP-210 (MH): 7.2v 1650mAh rechargeable Ni-MH battery for ICOM IC-V8, IC-V82, IC-U82 radio etc. Replaces BP-209 , BP-210 , BP-222 , etc. Provides longer running time, while physically remaining the same size. Re-charges in a desktop slow charger (supplied with your radio) or fast charger (sold separately). 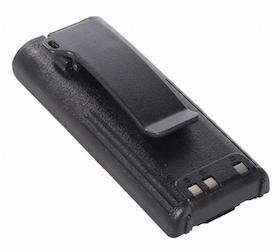 BP-208N : Alkaline Battery Case for ICOM radios (IC-V8, V82, U8, U82, A24, A6) etc. BP-208N: Alkaline Battery Case for ICOM radios. Fits the IC-V8, IC-A24, IC-A6, IC-V82, IC-U82, IC-F3GT, IC-F3GS, IC-F4GT, IC-F4GS, IC-F30GT, IC-F30GS, IC-F40GT, IC-F40GS, IC-F21BR, etc. Load with 6 x AA cells for handy instant power! CBE-210 : battery eliminator for ICOM IC-V8, IC-A24, IC-A6, IC-V82, IC-U82, IC-F3GS, IC-F4GS etc. CBE-210: Battery Eliminator for ICOM handheld radios such as the IC-V8, IC-A24, IC-A6, IC-V82, IC-U82, IC-F3GS, IC-F3GT, IC-F4GS, IC-F4GT, IC-F30GS, IC-F30GT, IC-F40GS, IC-F40GT, IC-F11, IC-F11S, IC-F21MG, IC-F21BR, etc. Enables high-watt mobile use ! EMS-210N: Desktop Rapid-Smart Charger for ICOM-style batteries such as BP-209, BP-209N, BP-210, BP-210N, BP-222, BP-222N, etc. Charges both Ni-Cd & Ni-MH.